Warm air in your house is sucked into the return vents (the vents that are not adjustable), through the return ductwork system, and is then blown across a coil (the evaporator coil which sits on top of your furnace). The evaporator coil contains refrigerant (freon) which was pumped into your house from the outdoor air conditioning unit (the condensing unit). Like a dry sponge absorbing water, the refrigerant absorbs the heat out of the warm air. Once the heat is absorbed out of the air, the now cooled air is blown back through the supply ductwork system into your house through the supply vents (the vents that can be adjusted with the little knobs). 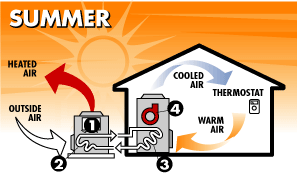 The refrigerant, which has just absorbed the heat from your house, is then pumped to the outdoor condensing unit. The outdoor condensing unit operates in a similar fashion to the evaporator coil in your house. A fan pulls outside air across another set of coils (the condensing coils) where the air absorbs the heat out of the refrigerant. This is similar to wringing out the sponge and giving the water to the outside air. After this process, in which the refrigerant just gave the heat that was absorbed from your house to the outside air, the refrigerant is rejuvenated and is then sent back to the evaporator coil in your home to absorb more heat. Another important function of your air conditioner is to dehumidify your house. Just like your mirror is foggy when you get out of the shower, the evaporator coil also grabs the moisture out of the air. This moisture is then taken out of your house via the condensate drain (usually the PVC pipes coming out of the top of your furnace). Properly sizing your air conditioner is critical to this dehumidification function of your air conditioning. If your air conditioner is too big, it will cool your house down too rapidly and then turn off before it has gotten a chance to pull enough moisture out of your house.